Called “page-turning space adventure” by Publisher’s Weekly, “adventure SF in the old tradition” by Bill Crider’s Pop Culture Magazine, and “a refreshingly new and fleshed out realm of sci-fi action and adventure” by Astro Guyz, Kristine Kathryn Rusch’s Diving Series offers stellar tales of the far future. 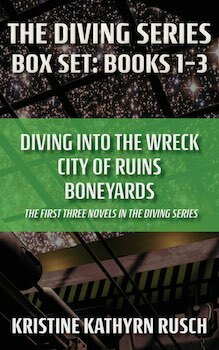 This starter bundle includes the first three books in the series: Diving into the Wreck, City of Ruins and Boneyards. Boss dives derelict space vessels, for money, yes, but more for their historical value. So, when Boss uncovers the find of a lifetime, she enlists the best divers she can convince to help her pursue it—off the grid and under the Empire’s radar. Boss’ discovery leads her and some of her team to the Room of Lost Souls. Boss remembers the Room. It haunts her. Her mother died there. Now, a client wants her to go back. She wants Boss to help her uncover the Room’s mysteries. But the truths she discovers might destroy everything Boss holds sacred. Because the more they discover, the less they realize they know—and the more it will cost them all. Years after stumbling across her first Dignity Vessel, Boss now leads a team of people searching for “loose” stealth technology. She takes a team to Vaycehn to investigate a phenomenon called death holes, thinking they might lead her to stealth tech. Captain Jonathon “Coop” Cooper and the crew of the Ivoire finally find a way out of foldspace despite their damaged anacapa drive. But he soon realizes the ship’s return to normal space is anything but normal. Coop and Boss hold the answer to questions both seek. But what they discover will change everything. Stealth tech: a lost science everyone wants to reclaim. The woman who helped Boss dive the Dignity Vessel, known then as Squishy, claims a long and storied history with stealth tech. Her research into the lost science caused deaths before, and she failed to prevent more during a fateful dive. Now, she vows to find a way to destroy the technology once and for all. Coop and Boss want to keep stealth tech out of the Empire’s hands, too, but for different reasons. “Stealth tech” powers Coop’s ship in the form of its anacapa drive. A drive that malfunctioned, leaving Coop and his crew stranded. But to find a way home, he must know what happened in the past. When Squishy’s actions threaten Coop’s mission, he must make a choice—help Boss attack the Empire, or risk losing his hope for a future.